The US Air Force's high-tech, unmanned X-37B spaceplane launched on March 5, 2011, entering low Earth orbit with the mission designation USA-226 and a set of tantalizingly vague mission parameters: to "demonstrate a reliable, reusable, unmanned space test platform for the United States Air Force." Now, a report in Spaceflight magazine claims to have uncovered the true objective of flight USA-226: to eavesdrop on China's recently launched spacelab, Tiangong-1. We know that Tiangong-1—which was launched back in September and is slated to host a manned crew sometime later this year—is in an orbit with an inclination of 42.78 degrees at an altitude of roughly 186 miles. And we know—not from the Pentagon but from a group of vigilant amateur space trackers—that the X-37B is orbiting at about the same altitude and at an inclination of 42.79 degrees. Not only is that orbit strange for a military recon satellite—they usually have polar orbits that offer better access to the entire globe—but it would periodically bring the two orbiters very close together. It's worth mentioning that the "vigilant amateur space trackers" that Dillow refers to aren't exactly tinfoil-hat donning conspiracy theorists. This hypothesis comes from none other than David Baker — editor of the British Planetary Society's Spaceflight magazine. 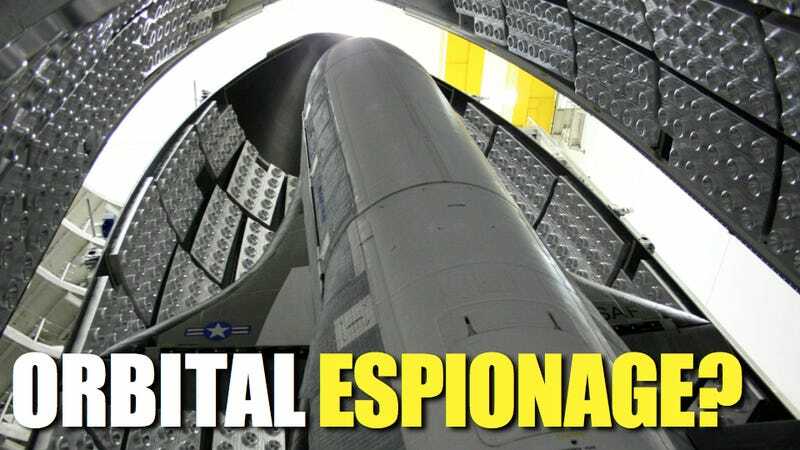 "Space-to-space surveillance is a whole new ball game made possible by a finessed group of sensors and sensor suites, which we think the X-37B may be using to maintain a close watch on China's nascent space station," he explains. China's Tiangong-1 launched at the end of September, and the country's unmanned Shenzhou 8 spacecraft successfully launched and docked with Tiangong-1 in early November. Was X-37B launched months ahead of China's space station with the intention of eventually monitoring it from space; was its mission extended when authorities realized that, according to the original mission timeline, they would only be able to squeeze in a few weeks of orbital espionage before having to return to Earth; or is X-37B simply going through test runs of totally non-espionagy equipment not spying on China at all? How far down the rabbit hole would you like to go?